BARC Notification is out. BARC is recruiting for 60 Upper Division Clerk And Stenographer Grade-III Govt Job Posts. You can check BARC - Bhabha Atomic Research Center last date, download BARC notification, visit BARC official website and check other BARC Vacancy details.Complete Vacancy and recruitment Details about 60 Upper Division Clerk And Stenographer Grade-III Govt Job vacancies in BARC are provided below by JobSarkari.Com only for you. Upper Division Clerk Rs. 100/- No Fee. Stenographer Grade-III Rs. 100/- No Fee. Mode of Payment. Candidate Can Pay Application Fee Through Online Mode. Upper Division Clerk Candidate Must Have Passed Degree or Equivalent with an Aggregate of 50% Marks. In case Universities Award Letter Grades / CGPA / OGPA, the Same will Have to be Indicated as Equivalent Percentage of Marks as Per the Norms Adopted by That University. In the Absence of the Same, the Candidate will not be Considered. 05 06 01 01 13. Stenographer Grade-III Candidate Must Have Passed Class 10th or Equivalent and Speed of 80 WPM in English Stenography and Typing speed in English of 30 WPM. 32 11 00 04 47. Total No. of Post 37. 17. 01. 05. 60. 6. Online Applications Can Be Submitted On or Before 25th February 2019. Q. 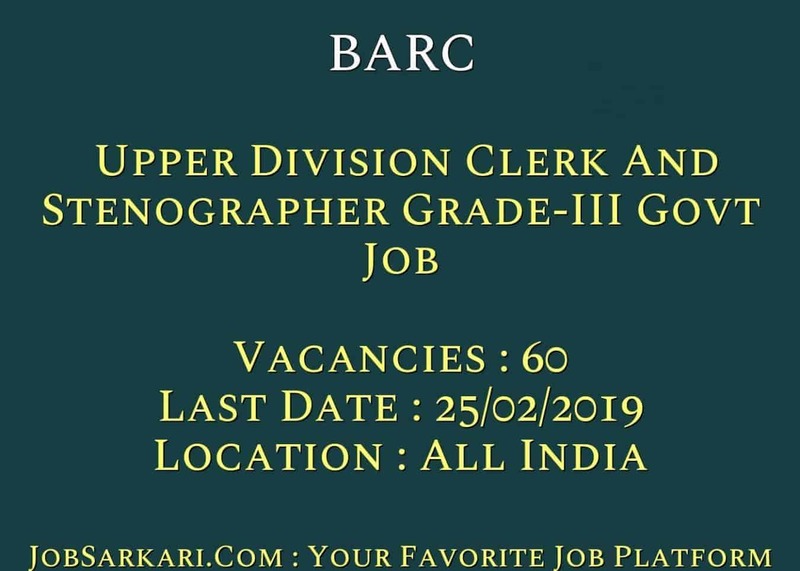 What is the Last Date For BARC Upper Division Clerk And Stenographer Grade-III Govt Job Vacancy ? A. 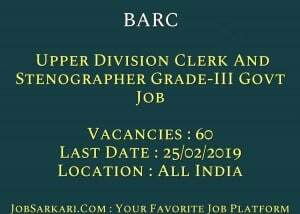 Last Date for BARC Upper Division Clerk And Stenographer Grade-III Govt Job Posts is 25/02/2019. Q. What is the Form Type of BARC Upper Division Clerk And Stenographer Grade-III Govt Job Recruitment ? A. The Form Type for BARC Upper Division Clerk And Stenographer Grade-III Govt Job Posts is Online. Q. How many vacancies are available in Bhabha Atomic Research Center Upper Division Clerk And Stenographer Grade-III Govt Job Posts ? A. There are about 60 Vacancies in Bhabha Atomic Research Center Upper Division Clerk And Stenographer Grade-III Govt Job Posts. Q. What is the Full Form of BARC ? A. Full Form of BARC is Bhabha Atomic Research Center .